In this study, the ability to produce mycotoxins during growth on artificially infested building materials was investigated for Penicillium chrysogenum, Pen. polonicum, Pen. brevicompactum, Chaetomium spp., Aspergillus ustus, Asp. niger, Ulocladium spp., Alternaria spp., and Paecilomyces spp., all isolated from water-damaged building materials. Spores from the different isolates of the above mentioned species were inoculated on gypsum board with and without wallpaper and on chipboard with and without wallpaper. Fungal material was scraped off the materials, extracted, and analyzed using high performance liquid chromatography-diode array detection and thin layer chromatography. All six isolates of C. globosum produced the toxic chaetoglobosins A and C, at levels of up to 50 and 7 μg/cm2 respectively. The quantities of secondary metabolites produced by Penicillia were generally low, and no toxin production was detected from any of the five isolates of Pen. chrysogenum. Both isolates of Pen. polonicum produced 3-methoxy-viridicatin, verrucosidin, and verrucofortine. Two of five isolates of Pen. brevicompactum produced mycophenolic acid. From five out of six isolates of Alternaria spp., alternariol and alternariol monomethyl ether were detected. 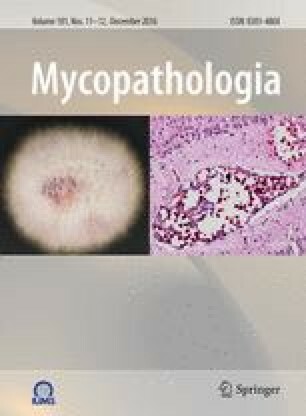 From Ulocladium spp., Paecilomyces spp., and Asp. ustus no known mycotoxins were detected, although the latter two are known mycotoxin producers. Asp. niger produced several naphtho-γ-pyrones and tetra-cyclic compounds. All investigated species, especially Asp. ustus and Asp. niger produced many unknown secondary metabolites on the building materials. Analyses of wallpaper and glass-fibre wallpaper naturally infested with Asp. versicolor revealed sterigmatocystin and 5-methoxysterigmatocystin. Analyses of naturally infested wallpaper showed that C. globosum produced the chaetoglobosins A and C, and Pen. chrysogenum produced the antibiotic meleagrin.